Total nonfarm payroll employment rose by 161,000 in October 2016. The unemployment rate was little changed at 4.9 percent. 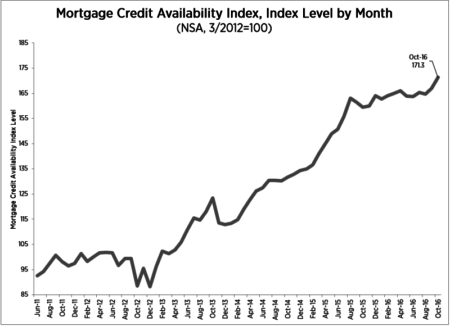 The MCAI increased 2.6 percentage points to 171.3 in October. Of the four component indices, the Jumbo MCAI saw the greatest increase in availability over the month (up 5.8 percent), followed by the Conventional MCAI (up 4.0 percent). The Conforming MCAI (up 2.2 percent) and the Government MCAI (up 1.6 percent) followed. 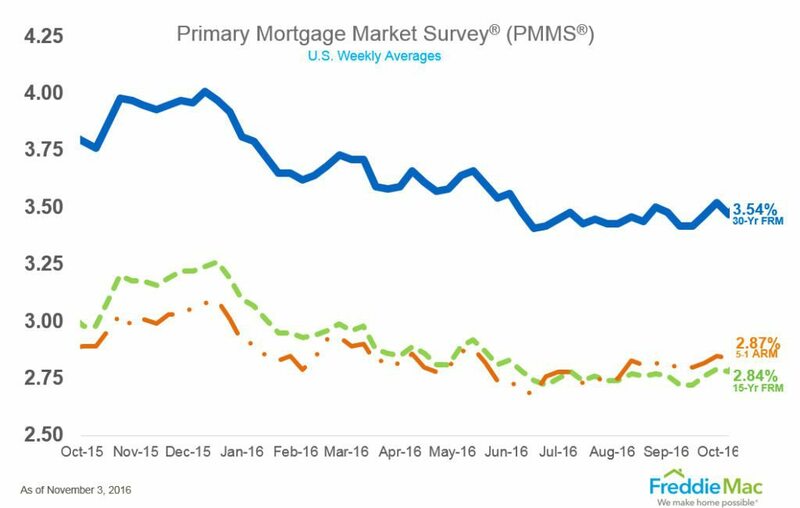 The 30-year fixed-rate mortgage (FRM) averaged 3.54 percent with an average 0.5 point for the week ending November 3, 2016. This is up from last week when it averaged 3.47 percent. Distressed sales accounted for 12.9 percent of all U.S. single family home and condo sales in Q3 2016. This is down from 15.0 percent the previous quarter. It’s also a decline from 15.9 percent in Q3 2015. Mortgage applications decreased 1.2 percent from one week earlier for the week ending October 28, 2016. The refinance share of mortgage activity remained unchanged at 62.7 percent of total applications from the previous week. The FHA share of total applications remained unchanged at 11.1 percent from the week prior. 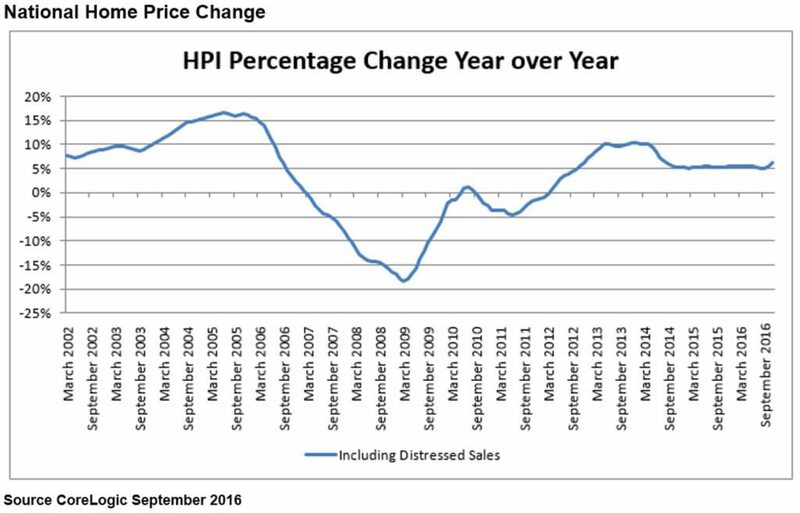 Home prices nationwide, including distressed sales, increased year over year by 6.3 percent in September 2016. They increased by 1.1 percent in September 2016 compared with August 2016. The CoreLogic HPI Forecast indicates that home prices will increase by 5.2 percent on a year-over-year basis from September 2016 to September 2017. Construction spending during September 2016 was estimated at a seasonally adjusted annual rate of $1,150.0 billion. This is 0.4 percent below the revised August estimate of $1,154.4 billion. This is also 0.2 percent below the September 2015 estimate of $1,152.1 billion. 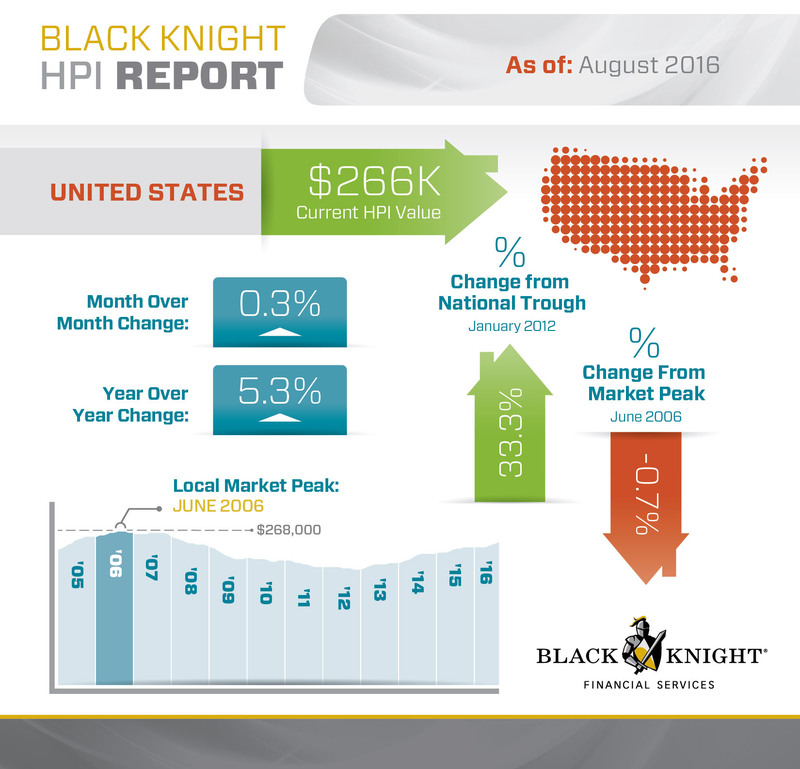 The current Black Knight HPI value is $266,000. This is up 0.3 percent month-over-month. It’s also up 5.3 percent year-over-year. The frequency of defects, fraudulence and misrepresentation in the information submitted in mortgage loan applications decreased 1.4 percent in September 2016 compared with August 2016. Compared to September 2015, the Defect Index decreased by 14.8 percent. 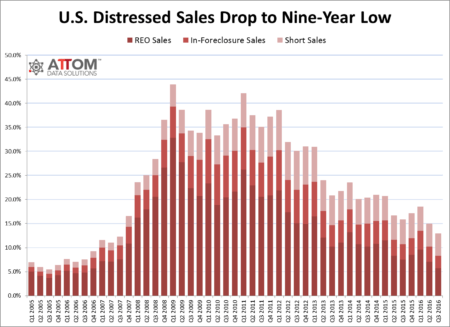 The Defect Index is down 32.3 percent from the high point of risk in October 2013.